Alexander Khozov, the minister of sports and tourism of the Astrakhan Region, answered the questions of the journalists at the press-conference. Question: Who suggested the idea to organize a Grand Prix event in Astrakhan? A.K. : It happened rather spontaneously. Our Governor received an offer from FIDE, and decided that we must organize this event in Astrakhan. The reason is obvious – this tournament will give a boost to chess development in the region. A.K. : One has to understand that this Grand Prix is a world class event, similar to tennis Grand Slam. The best chess players in the world are fighting for the ticket to the candidates matches, where they can challenge the chess crown. Having such a competition is interesting for us in any case. First of all, it promotes our region, and, second, chess development is one of the priorities in the Astrakhan Region. Q: How difficult was organizing such a serious event? A.K. : Obviously it was quite challenging. However, we received a lot of help from FIDE representatives, who have vast experience in arranging chess events. As far as I know, the players were saying that they have no complaints about the level of organization, and this makes us happy. I have to admit that organizing such competition is a very serious and scrupulous work that demands a lot of money, too. Q: The players seem to really like the playing venue, the Youth Theatre. Who selected this place? A.K. : This competition is organized as one of the events dedicated to the 450th anniversary of our city. We renewed or reconstructed almost all theatres and historical buildings in the city, and decided to use the Youth Theatre for this event, because it meets all the demands. Also, it was chosen by a FIDE inspector, who visited other buildings we offered – the Drama Theatre, the Conservatory, and “Zvezdnyj”. 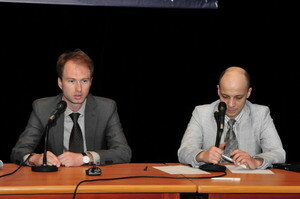 Q: What do you think about future of chess in Astrakhan? A.K. : I am sure that this Grand Prix will promote chess to one of the main sports in our region. Do you like the current state of chess in Astrakhan? I am not happy about it at all. Chess players don’t even have a place to meet, and there is no real chess school in the city. The Governor has already taken all the appropriate decisions. Construction of a new Musical Theatre will be finished in the autumn. We already examined this building with FIDE representatives, and it seems to be an excellent place for a chess development center. The FIDE President will help us to equip the hall that is reserved for chess needs. Q: Are you satisfied with the course of the tournament? A.K. : Yes, of course. It is still underway, but the players and FIDE officials were very complementary about our work. Q: Do you play chess yourself? A.K. : Yes, I played chess actively when I was a kid – made a second category and won the regional “Belaya Ladya” championship. Now I follow all the major chess events with great interest, not only as chess enthusiast, but also as sports minister.